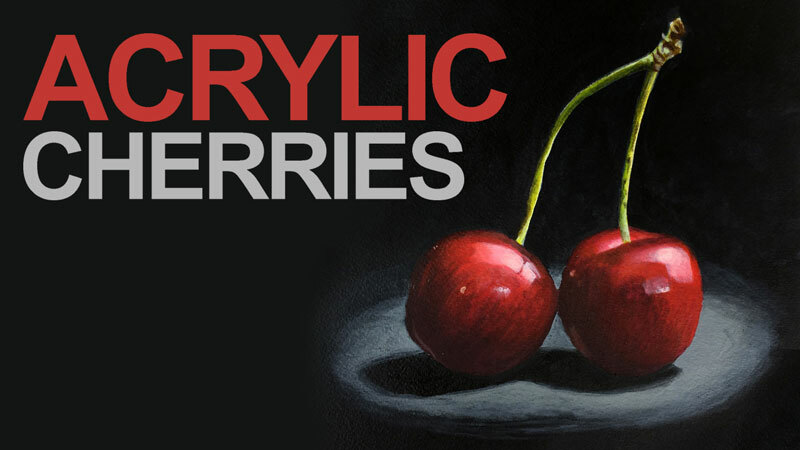 A four-part series on painting a still life arrangement of cherries with acrylic paint. The painting is completed on watercolor paper which eradicates much of the texture that is produced by traditional canvas, allowing for smoother transitions of value and color. Four hours of video instruction are included in this series. It sounds as though you have the volume on the player turned down. To turn up the volume, scroll over the video player and look for the small vertical rectangles in the lower right corner. Click on the rectangles to turn the volume up. 1.where is the link for the golden acrylic? Thanks for pointing out the oversight. I have included the link in the materials section. Yes, definitely used styro-foam plates before. I couldn’t find the second part of the wine bottles drawing , it didn’t follow after the first part. You stated that you would finish the rest of the drawing in the next video.?? Hi Matt, really like painting on paper. The painting of the cherries is awesome. Can’t wait for next weeks lesson. Matt what was the yellow you used in the second lesson? I couldn’t quite make it out. Thanks. It’s “Hansa Yellow”. I hope this helps. where did your acrylic paint from? Thank you. These are Golden Acrylics. I was fortunate enough to have the company send them to me a while back.